Herbs , erect to decumbent, to 0.6 m. Young stem ridged, glabrous to hispid. 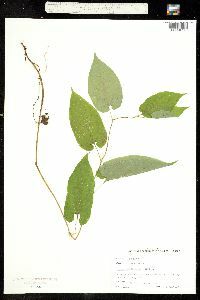 Leaves: petiole 0.5-3.5 cm. Leaf blade lanceolate to ovate, 5-15 × 1-5 cm, base truncate to cordate, sinus depth 0-1.5 cm, apex acute to acuminate; surfaces abaxially glabrous or hispid; venation pinnate. Inflorescences from base of stem, an additional flower in axil of stem leaf, racemes; peduncle bracteolate, to 1.5 cm; bracteoles lanceolate, to 3 mm. Flowers: calyx brown-purple, bent; utricle pendent, pear-shaped to ovoid, 0.5-5 cm; syrinx present, ringlike, 1 mm, oblique; tube bent, cylindric, 1 cm; annulus smooth; limb purplish brown, 3-lobed, lobes 0.5 × 0.5 cm, glabrous; gynostemium 3-lobed, globose to crown-shaped, 1.5 mm; anthers 6; ovary 3-locular, to 1.5 cm. Capsule globose, 0.8-2 × 1-2 cm, dehiscence basipetal; valves 6; septa absent. Seeds rounded, ovate, 0.5 × 0.4 cm. 2 n = 28. Flowering late spring-summer. Mesic forests; 50-1300 m; Ala., Ark., Conn., Del., D.C., Fla., Ga., Ill., Ind., Iowa, Kans., Ky., La., Md., Mich., Miss., Mo., N.J., N.Y., N.C., Ohio, Okla., Pa., S.C., Tenn., Tex., Va., W.Va. Inflorescences of Aristolochia serpentaria often bear closed flowers that appear to be cleistogamous. Leaf shape varies greatly between populations, especially with regard to leaf width and size of basal lobes. This variability is especially interesting because eastern pipe-vine swallowtail butterflies, Battus philenor philenor (Linnaeus), use leaf shape as a search image when looking for Aristolochia leaves on which to lay their eggs. The dried rhizome, called Virginia snakeroot or serpentary, is a popular herbal tonic. In small doses, it is a gastric stimulant and diuretic. Large doses can cause violent gastric distress and respiratory paralysis (J. A. Duke 1985). The rhizome contains aristolochic acid and trimethyl amine, both potential carcinogens. Several Native American tribes used Aristolochia serpentaria for diverse medicinal purposes, including treatment of rheumatism, various pains, obstructions, worms, toothaches, sore throats, fever, sore noses, and colds, as a tonic, and mixed with saliva for snake bites (D. E. Moerman 1986). Perennial herb to 0.6 m tall Stem: erect, hairless to bristly-hairy, ridged. Leaves: alternate, stalked, 5 - 15 cm long, 1 - 5 cm wide, lance- to egg-shaped or oblong with an arrow- to heart-shaped or squared base and a pointed tip, hairless or bristly-hairy. The lower leaves are reduced to scales. Flowers: borne solitary near base of stem, lacking petals but having a tubular S-shaped calyx and six stamens. The calyx is brownish purple, 1 - 2 cm long, enlarged at the base and tip, and unevenly three-lobed at the tip. Fruit: a dry capsule, 0.8 - 2 cm long, 1 - 2 cm across, nearly spherical, with egg-shaped seeds about 5 mm long. 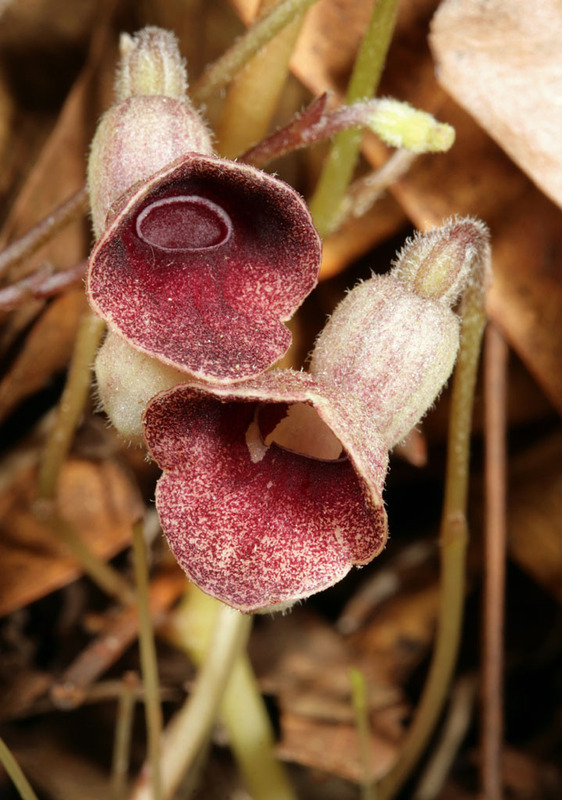 Similar species: Asarum canadense is easily distinguished from this species because it has a pair of heart- to kidney-shaped leaves arising from the rhizome and fleshy capsules, but it lacks S-shaped flowers and an erect stem. Habitat and ecology: Mesic woodlands, often in calcareous soils. Notes: Pipe-vine swallowtail butterfly larvae feed on the leaves and ingest aristolochic acid, making the larvae unpalatable to birds. Etymology: Aristolochia comes from the Greek words aristos, meaning best, and lochia, meaning delivery, referring to its old use as a childbirth aid. Serpentaria refers to the supposed ability of this species to heal snake bites. Stems erect from a rhizome, to 6 dm, thinly hairy; lvs ovate to oblong or nearly linear, acuminate, truncate to sagittate or cordate at base, 6-12 cm; lower lvs reduced to scales; fls solitary on slender, scaly peduncles from the lowest nodes; perianth S- shaped, enlarged at base and summit, 1-2 cm, the spreading limb madder-purple, unequally or indistinctly 3-lobed; 2n=28. Moist or dry upland woods; Conn. and s. N.Y. to s. Mich., Ill. and Mo., s. to Fla. and Tex. May, June.